PUR BASIC FAUCET WATER FILTER: PUR Basic Faucet Filter in Black attaches to your sink faucet, for easy, quick access to cleaner, great-tasting filtered water. A CleanSensor Monitor displays filter status, so you know when it needs replacement. FAUCET WATER FILTER: PUR's Basic faucet filters are certified to reduce over 70 contaminants, including 99% of lead, so you know you're drinking cleaner, great-tasting water. They provide 100 gallons of filtered water, or 2-3 months of typical use. 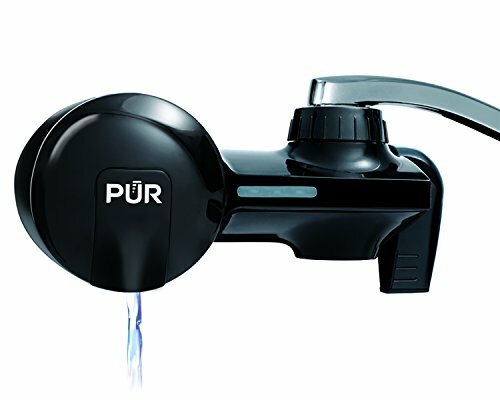 SUPERIOR WATER FILTRATION: PUR faucet water filters reduce over 70 contaminants, including lead & chlorine, by using activated carbon & ion exchange. Using a PUR water filter for tap water is more affordable than bottled water, save up to $1,000 per year.